To contain fragments of a soul and prevent death. A Horcrux is a powerful object in which a Dark wizard or witch has hidden a fragment of his or her soul for the purpose of attaining immortality. Creating one Horcrux gives one the ability to anchor one's own soul to earth if the body is destroyed; the more horcruxes one creates, the closer one is to true immortality. Creating multiple Horcruxes is suggested to be costly to the creator, by both diminishing their humanity and even physically disfiguring them. The first Horcrux was created by Herpo the Foul. The only other known creator of them was Lord Voldemort, who is possibly the only one to have successfully created more than one Horcrux. In fact, Voldemort created seven horcruxes. Slughorn mentioned that the fate of those who use Horcruxes to survive is what only few would prefer, suggesting that few others have created their own Horcrux. The nature and concepts of Horcruxes are so terrifying, they were kept secret from most of the wizarding world, and only few ever knew what they were. Hogwarts banned the subject of Horcruxes, and even books such as Magick Moste Evile only skim the subject at best. The only known book that explains Horcruxes in detail is Secrets of the Darkest Art. As little is known of the subject, no one knew what the effects of creating more than one Horcrux would be, because, aside from Voldemort, nobody has done so. The only known book that provides specific instruction on the creation of a Horcrux is Secrets of the Darkest Art, once held in the Hogwarts Library. Due to the book's extremely dark and dangerous nature, Albus Dumbledore hid it away in his office; however, he did not destroy it. It is believed that Tom Riddle found the information necessary to make a Horcrux in this book. A Horcrux is one of the darkest arts in existence as it involves splitting the soul, which is intended to remain whole, through the most supreme act of evil, murder. Tom Riddle: "And how exactly does one split his soul?" Slughorn: "Well, you must understand that the soul is supposed to remain intact and whole. Splitting it is an act of violation, it is against nature." Tom Riddle: "But how do you do it?" Slughorn: "By an act of evil — the supreme act of evil. By committing murder. Killing rips the soul apart. The wizard intent upon creating a Horcrux would use the damage to his advantage: he would encase the torn portion —"
The specific processes involved are known to involve a spell and a very horrible act. To split one's soul, one must also commit the most supreme act of evil—murder—and then encase a portion of their fractured soul into a chosen object with the spell. The detached soul fragment will always remain as it was when it was divided; for example, Tom Riddle's diary portrayed Tom Marvolo Riddle as a teenager, and the eyes inside Salazar Slytherin's locket resembled Voldemort's eyes as they were when he looked more human. Though a Horcrux can be made from anything (including living creatures), Lord Voldemort chose to use objects of great significance or importance. The process makes the part of the soul remaining in the witch or wizard unstable. If the maker's physical body is later destroyed, he or she will live on in non-corporeal form, although there are methods of regaining physical form. However, according to Horace Slughorn, few would want to live in such a form and death would be preferable. It is stated at one point that Voldemort had already "pushed his soul to the limit" in creating his seven Horcruxes. This implies a finite number of Horcruxes any one person may create before the process becomes too dangerous to attempt again. Though this limit is never explicitly stated, the number seems to set solidly at seven intentional Horcruxes, and creating seven Horcruxes in addition to the person's own body renders the soul unstable and liable to break off when the person whose soul it is commits murder. Dumbledore explicitly stated that Voldemort's soul had become so unstable that it finally "broke apart" when Voldemort tried to murder Harry for the first time. Ron: "Isn't there any way of putting yourself back together?" Hermione: "Yes, but it would be excruciatingly painful." Harry: "Why? How do you do it?" Hermione: "Remorse. You've got to really feel what you've done. There’s a footnote. Apparently the pain of it can destroy you. I can’t see Voldemort attempting it somehow, can you?" The creation of a Horcrux can be reversed by its creator by truly feeling remorse, though the effects of this can apparently be painful to the point of being fatal. However, as described below, this may be a far preferable outcome than the alternative. Interestingly, since Dumbledore said that "there is no help possible" for Voldemort's soul, it may be that any soul as badly damaged as Voldemort's could no longer be repaired through remorse as described in Secrets of the Darkest Art. Alternately, the soul can still be repaired through the redemptive power of repentance. Harry told Voldemort to "try... be a man... try for some remorse. It's your one chance. It's all you've got left." This seems to indicate that though Tom Riddle's soul is maimed and seriously injured, he can still repair it by regretting all the horrible things he did; Dumbledore may simply mean that Voldemort is incapable of remorse to save his own soul, or just referring to the fragment that Voldemort himself destroyed and the piece Harry found, as opposed to his "main" soul. Harry: "So if all of his Horcruxes are destroyed, Voldemort could be killed?" Dumbledore: "Yes, I think so. Without his Horcruxes, Voldemort will be a mortal man with a maimed and diminished soul." Horcruxes can also be destroyed. If a person's body was destroyed, his or her soul would remain intact, whereas with a Horcrux it is the opposite, as the piece of soul depends upon its container to survive. Destruction of a Horcrux is difficult, but not impossible, and requires that the receptacle to be damaged completely beyond physical or magical repair. When a Horcrux is damaged to this point, it may appear to "bleed" (ink in the case of Tom Riddle's Diary and a "dark blood-like substance" in the case of Ravenclaw's Diadem) and a scream may be heard as the soul fragment perishes. However, as a safety measure to protect one's immortality and precious soul fragment, the creator would usually place powerful enchantments onto the artefact to prevent damage, to the point where the most powerful house-elf magic will not succeed. It is unknown if the creator of the Horcrux would be able to sense that his soul fragment was destroyed, although Dumbledore stated that in the particular case of Voldemort, he wouldn't feel their loss because his soul was sliced too many times and stayed that way for too long. All known methods of Horcrux destruction are as deadly as the murder needed for its creation. For example, the earliest known method is administering basilisk venom to the Horcrux, the only cure for which is phoenix tears, an extremely rare substance. Other known methods are Fiendfyre (as evidenced by its destruction of Rowena Ravenclaw's Diadem), which requires extreme skill to control and the Killing Curse which seems to be capable of destroying a Horcrux if it is animate, given that part of Voldemort's soul contained in Harry Potter was destroyed when he was struck with the Killing Curse in 1998. However, Harry Potter was never an intentional Horcrux and so it may not work on a proper, animate Horcrux (like Nagini), probably having unforeseen side effects. Harry Potter was not destroyed as a Horcrux in the Chamber of Secrets because Fawkes' tears saved him and hence the "receptacle" (Harry) was not then destroyed beyond repair. Albus Dumbledore, Ron Weasley, and Neville Longbottom used Godric Gryffindor's Sword to destroy Marvolo Gaunt's Ring, Salazar Slytherin's Locket, and Nagini respectively. This was only achievable as the sword is a Goblin-made artefact, which can absorb qualities that strengthen it. When Harry Potter slew the Basilisk in the Chamber of Secrets, the sword was imbued with Basilisk venom and became capable of destroying Horcruxes, as Basilisk venom by itself is destructive enough a substance to destroy a Horcrux. Harry Potter and Hermione Granger used Basilisk fangs from the Chamber of Secrets to destroy Tom Riddle's Diary and Helga Hufflepuff's Cup, respectively. Ron: "The bit of soul in that diary was possessing Ginny, wasn’t it? How does that work, then?" Hermione: "While the magical container is still intact, the bit of soul inside it can flit in and out of someone if they get too close to the object. I don’t mean holding it for too long…I mean close emotionally. Ginny poured her heart out into that diary, she made herself incredibly vulnerable. You’re in trouble if you get too fond of or dependent on the Horcrux." The fragments of a person's soul within a Horcrux can think for themselves and have certain magical abilities, including the ability to influence those in their vicinity. When Harry, Ron, and Hermione were carrying Salazar Slytherin's Locket around their necks in 1997, they each became moodier and more prone to fighting, especially Ron. They were also unable to summon their Patronuses while wearing the locket since the soul fragment inside was darkening their thoughts. A person with an affinity for the Dark Arts, on the other hand, would be strengthened by the influence of a Horcrux, as Dolores Umbridge was when wearing Salazar Slytherin's Locket. If a person is more emotionally vulnerable, it is possible for the soul inside the Horcrux to take control of him or her, as Tom Riddle's Diary did to Ginny Weasley. In fact, Voldemort took advantage of this possessive power to reopen the Chamber of Secrets, using the diary as a weapon rather than a safeguard. In this way, a Horcrux can gradually feed on another person's life or negative emotions to strengthen itself and increase the ability of the soul fragment within to act independently in the physical world. The best example of this is in the case of Tom Riddle's diary. For decades, the diary lay dormant in Lucius Malfoy's possession, doing nothing other than safeguarding the soul fragment of Tom Riddle. When Ginny Weasley began to transcribe her fears and insecurities into the pages of the diary, the fragment of Tom Riddle's soul contained within was not only able to write back to Ginny but eventually drained enough life out of her to actually manifest itself in a semi-corporeal form and work magic with Harry Potter's wand. Likewise, Salazar Slytherin's Locket slowly gained power when it was in the possession of Harry, Ron, and Hermione in the months prior to its destruction. It can be theorized that the locket gained somewhat less power from them (not enough for Riddle to fully manifest but still enough to speak and create illusions) because Harry, Ron, and Hermione were actively resisting the locket's influence instead of embracing it as Ginny had done with the diary. On the other hand, Horcruxes which have been isolated for long periods of time (such as Hufflepuff's Cup and Ravenclaw's Diadem) were very passive by comparison and took no real measures to protect themselves. Even Slytherin's Locket was fairly inert when it was initially discovered in a cabinet in the drawing room at 12 Grimmauld Place, displaying no powers other than being impossible to open. Horcruxes also possess some last line of defence against destruction. The fragment of soul within the Horcrux seems to be able to sense impending threats and can act to defend itself. For instance, Slytherin's locket viciously taunted Ron Weasley with visions of his deepest fears in the hopes of preventing him from stabbing it with the Sword of Gryffindor, and even attempted to strangle Harry Potter when he was close to obtaining the Sword with the intent of piercing the locket. However, this form of defence may not be viable if the soul fragment in question is not given enough strength or chance to retaliate, as while Harry opened the locket with Parseltongue before allowing Ron to attack it, both Hufflepuff's Cup and Ravenclaw's Diadem were swiftly destroyed the moment the trio were given an opportunity. Aside from its self-defence mechanism from the soul fragment, a Horcrux is usually enchanted by the creator to have other forms of defences to prevent destruction. Marvolo Gaunt's ring contained a deadly curse that would kill anyone who touched it. At least Salazar Slytherin's Locket was unbreakable by even house-elf magic. Tom Riddle's diary was completely waterproof and impervious to spilled ink. To create a Horcrux is to divide one's soul — the "essence of self" — and it is therefore in the creation of a Horcrux that one falls prey to Adalbert Waffling's first Fundamental Law of Magic, which essentially states that tampering with one's soul inevitably results in grave side effects. One of these such side-effects is the "dehumanising" effect the mutilation of one's soul is said to have. The more Horcruxes one creates, the less human they become, both emotionally and physically; for example, in the house-elf Hokey's memory Tom Riddle is initially shown to be hollow-cheeked but otherwise normal, though ten years later his features look as if they have been burned and blurred, and his skin is extremely white. One can hence assume that during those ten years he had created more than one Horcrux that in turn wrought the physical changes in Voldemort over that timespan. Of course, this initial consequence of dehumanisation has its own side effect; it logically follows that if one becomes dehumanised by Horcrux creation then they will take less stock of morality in general, increasing the likelihood that they will create another Horcrux, which would in turn make them less human and hence less moral, which further increases their likelihood of making more Horcruxes and so on. In other words, Horcrux creation may be thought of as a "slippery slope" or "downward spiral" until one reaches the limit, at which point no more Horcruxes may be made. One should note that it is unclear whether the red eyes and slit-like nostrils that Voldemort has after he is reborn are caused by having more Horcruxes than he did than when he applied for the Defence Against the Dark Arts post a second time, or whether they are characteristics of a person who has been resurrected with the help of serpents (who have continued to play key roles in his revival). It is probable that he performed these transformations prior to his resurrection as all of his Death Eaters seem to recognise him without question after Voldemort returned. A third side effect of Horcrux creation is that the Master Soul itself becomes unstable (even with creating just one Horcrux). The precise dangers of this spiritual destabilization are not currently detailed explicitly throughout the franchise, however, some can be gleaned from the events in the books. For example, the creation of Voldemort's seventh "Horcrux"—Harry Potter—is known to be the direct result of this. When Voldemort was hit by the back-fired Killing Curse at Harry's parent's home in Godric's Hollow, it caused Voldemort's soul to split, with one fragment remaining in him and the other displaced part immediately seeking out the only other living thing in the room and latching onto it—Harry Potter. However, this parasitic fragment of Voldemort's soul that attached to Harry is not actually a Horcrux, since it was not created intentionally and the necessary parts of the Horcrux creation process were not carried out. The final known side-effect of Horcrux creation is the inability to move on from Limbo after death. This is seen when Voldemort's Killing Curse (after the destruction of all the other Horcruxes) rebounded and finally ended his life once and for all, his broken and mangled soul was forced to exist in the stunted form of a flayed and mutilated baby that Harry saw in King's Cross during his visit to Limbo, unable to return to the land of the living, unable to become a ghost, and unable to go to the land of the dead because his soul was maimed and unwhole. It is unknown if this was a standard fate meted out for all Horcrux creators, or if it was unique to Voldemort due to the number of his Horcruxes. Regardless, reconciliation cannot occur after death, as the soul's state at death remains forever, so the greatest of all consequences incurred by Horcrux creation may be the possibility of eternal limbo of the soul. Lord Voldemort, obsessed with immortality and inability to understand the importance of the soul's well-being, went further than any wizard known to history to create seven — although he had an eight-part soul, because he accidentally created his sixth Horcrux when he failed to kill Harry Potter in 1981, and later made his pet snake Nagini into what he thought was the sixth, but was in fact the seventh, Horcrux. As a student named Tom Marvolo Riddle at Hogwarts in the 1940s, he learned of Horcruxes through books in the Restricted Section, including Secrets of the Darkest Art, and sought out Potions master Horace Slughorn for further information about creating more than one, of which no book would have any record. Albus Dumbledore removed those books from the Hogwarts Library soon afterwards. Although later he suspected that Slughorn had given information to Riddle about Horcruxes, Slughorn refused to reveal the true account of what really happened. Dumbledore later assigned Harry to retrieve the stored memory of it during the 1996–1997 school year. Harry was able to get it through the use of Felix Felicis. This was part of Dumbledore and Harry's quest to determine, locate, and destroy, in secret, what they believed to be as many as six of Voldemort's Horcruxes. After Dumbledore's death, Harry took up the quest with his friends Ron and Hermione. Hermione was able to Summon the books on the subject to her from the Headmaster's office at the end of the 1996–1997 school year to aid them in their research on Horcruxes. Although Voldemort had seven Horcruxes, no more than six existed at one time because Tom Riddle's diary was destroyed before Nagini was turned into a Horcrux. Hence he did have his soul split in seven pieces as he intended; however, it conferred no special added protection as he seemed to feel it might. Concerning Nagini, it is not known if she had to have been killed by Godric Gryffindor's Sword or if any other means, such as a regular sword killing her, would have destroyed the Horcrux. However, as Albus Dumbledore stated, using a living being as a Horcrux is a risky business, due to it being able to move around and think for itself. It is unknown if any method that would normally kill Nagini would also destroy the Horcrux. All of Voldemort's Horcruxes are made from objects that have extreme value, in his desire to secure his position as the greatest in history, and that only noteworthy items can live up to his standards and having the honour of housing a fragment of his precious soul. As such, he had originally made it his desire to collect four items of the four founders of Hogwarts; he found only three, and gave up after failing to find another, but made Horcruxes out of other items that have sentimental value to himself, if not as a priceless artefact of the Wizarding world. Believing the number seven is the most powerful, Voldemort intended to split his soul into seven pieces, with six Horcruxes housing one fragment each and his main body the seventh. He hid these Horcruxes in special locations and kept their existence and purposes from absolutely everyone. However, his arrogance has also inadvertently let him leave behind subtle hints of their whereabouts, leading to their demises. The word Horcrux may be derived from the French dehors, meaning "outside," and crux, meaning "soul". In a nutshell, Horcrux may mean "The Soul Outside". 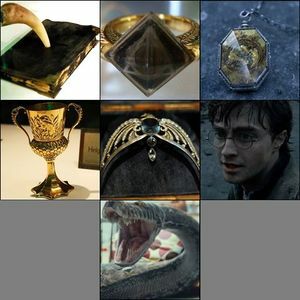 The word Horcrux may be also composed by "hor" or "hore" (old English/middle-English) meaning "dirt, evil, impurity" and "crux" or "crúce" (old English) meaning "container, pitcher(ful), jar". Besides, Horcrux is a contraction from "horrible" (English) meaning "frightful, flagitious, unworthy, wretched, terrible, monstrous, fearful" and "crux" (Latin) meaning "the Cross". J. K. Rowling revealed in Pottermore that Prof. Quirinus Quirrell served as a temporary Horcrux when Voldemort's soul possessed his body during Harry Potter's first year at Hogwarts. A notable difference however is that the piece of soul within Quirrell was able to exist without its container, as it abandoned Quirrell and left him to die in the Underground Chambers. This is due to it being the "main" soul that serves as the awareness and consciousness of Voldemort's psyche. Based on this, the animals that Voldemort inhabited during his years of exile, such as rats and snakes, can also be considered as temporary Horcruxes. J. K. Rowling knows exactly what the process for the creation of a Horcrux is, but is not telling — yet. The information will be included in the Harry Potter Encyclopedia. She has told her editor what the process is and revealed that the editor felt like vomiting afterwards. All she will say is that a spell is involved, and a horrific act is performed. However, since the encyclopedia may have been canceled, the information may eventually be revealed on Pottermore. J. K. Rowling described the invention of the Horcrux as comparable to the splitting of the atom: "Something that people imagined might be able to be done, but couldn't quite bring it off, and then... and then people started doing it with sometimes catastrophic effects." In an interview, J. K. Rowling was asked why the Horcrux within Harry wasn't destroyed after he was poisoned by the basilisk in Harry Potter and the Chamber of Secrets. She replied that Fawkes's tears "mended" him before he could be destroyed beyond repair. The only Horcrux that Harry personally destroyed was Tom Riddle's Diary, even though he was the only one clearly stated to be sent for the mission. Also, he did not even know that it was a Horcrux at the time. The Ring was destroyed by Albus Dumbledore, the Locket by Ron Weasley, the Cup by Hermione Granger, the Diadem with Fiendfyre that was conjured by Vincent Crabbe, Nagini was killed by Neville Longbottom, and the fragment within Harry was inadvertently destroyed by Voldemort himself. In the film adaptation, however, the Diadem is stabbed with a basilisk's fang by Harry and then kicked by Ron into the oncoming Fiendfyre. Of the seven Horcruxes Voldemort created (intentionally and unintentionally), four of them were destroyed during the Battle of Hogwarts, along with Voldemort himself. In fact, aside from Salazar Slytherin's Locket, all Horcruxes were destroyed within Hogwarts grounds, either during or before the aforementioned battle. In the film version of Harry Potter and the Half-Blood Prince, the only Horcruxes mentioned are the diary, the ring, and the locket, leaving Harry with no direction in the film adaptations of Harry Potter and the Deathly Hallows. In addition, Ginny hides Harry's potion book while Harry closes his eyes (as well as kissing him for the very first time), and there is no indication that Harry sees the diadem. There has been controversy of the fact that, in the films, Harry, Ron and Hermione do not have any leads to find the remaining Horcruxes, apart from the locket. However, in the film version of Harry Potter and the Half-Blood Prince, it is shown that a Horcrux will leave a trace of Dark magic - this gives the person who touches the Horcrux visions of associated events and other related Horcruxes. A scene in the sixth film shows Harry touching Marvolo Gaunt's Ring and experiencing a flow of high speed visions including Tom Riddle screaming in agony (possibly due to the method of ripping his soul) and Nagini, one of Lord Voldemort's Horcruxes. This is also stated in Steve Klove's script for the film. This would ultimately lead Harry, Ron, and Hermione to know most (if not all) of the Horcruxes in the film versions of Harry Potter and the Deathly Hallows. A person who is a Horcrux also seems to possess some of the creator's abilities such as Harry Potter being able to use Parseltongue which is one of Voldemort's inherited abilities. It also creates a mental link between the two the strength of which seems to depend upon the strength of the creator. For example, when Voldemort was weak and only in a spiritual form, Harry could only sense his presence when he was close by and feel his anger, but after he returned to somewhat of a body, this expanded a bit into the occasional dream vision of things happening with Voldemort. After Voldemort returned to full power, this link expanded so that Harry got full visions in his dreams of what Voldemort was dwelling upon, but the link can also be two-way and Voldemort was able to use it and Legilimency to implant a false vision in Harry's mind. The link can be shut off with Occlumency on the part of one of the two with the link, but if the Occlumency slips, the link can reopen. The only way to sever the link completely and remove the abilities the Horcrux gives is to destroy the Horcrux itself. It is debatable if the Killing Curse can destroy inanimate Horcruxes, although given the extreme measures Harry, Ron, and Hermione had to go through to obtain Basilisk venom to destroy the Horcruxes they found during their search, it seems unlikely. According to Dumbledore, Voldemort was preserving the creation of his Horcruxes for significant deaths. However, this stands to be another one of Dumbledore's deductions being wrong, as Voldemort has used a Muggle tramp and Albanian peasant to create two of his Horcruxes, with no known significance for the two. However, Dumbledore only knew for certain of two of the murders committed to create Voldemort's Horcruxes: the murder of Moaning Myrtle (his very first killing) to create the diary, and murder of Tom Riddle Sr., his father, for the Gaunt Ring Horcrux. Both of these murders were very significant, but it turns out later that Dumbledore was incorrect that all Horcrux-related deaths were important ones. J.K. Rowling's exact definition of a Horcrux is "a receptacle prepared by dark magic in which a Dark wizard has intentionally hidden a fragment of his soul for the purpose of attaining immortality." The concept of a "soul container" is not original to the world of Harry Potter. See this page for more information. Interestingly, the majority of the people who destroyed Voldemort's Horcruxes didn't know what they were destroying at the time. Neville didn't know what Horcruxes were when he killed Nagini, Harry didn't know about Horcruxes when he destroyed the diary, Voldemort didn't know he was destroying a Horcrux when he attempted to kill Harry Potter, and Vincent Crabbe didn't know what he was destroying when he destroyed the diadem. Hermione, Ron, and Dumbledore all knew that they were destroying Horcruxes, which was exactly what they were trying to do. The books previously established that Voldemort can't feel when a Horcrux is destroyed. However, this was completely reversed in the movies. That is the reason he starts on the journey of seeing if all the Horcruxes are safe in the books, but in the movies it is unclear if he even checks his hiding spots. When Hermione destroys the Hufflepuff Cup, Voldemort, Harry and Nagini all seem to be momentarily incapacitated by pain. This also happens when the Ravenclaw Diadem and Nagini are destroyed, clearly showing that all Horcruxes and the Master Soul feel the destruction of the others. In the fairy tale The Warlock's Hairy Heart, the main character of the story stores his own heart outside of his body via dark magic, similar to Horcruxes in both function and consequences. It was a feat considered impossible outside of the storybook. ↑ 7.0 7.1 Pottermore - "New from J.K. Rowling: Professor Quirrell"
This page was last edited on 15 July 2015, at 13:40. This text is available under the GNU FDL and may have been adapted from the Wikipedia article about Horcrux (history).